I had mentioned in my ragi rotti recipe that I will put ragi modhe too. Finally i got time to put it. This is a very popular dish in rural Karnataka , not only because it is very filling but also very cost effective. This is to be eaten with sambar. I am carving for some Mudde too, but have to make Soppina saaru or Mulangi gojju for it. Looks delicious. A very happy 2010 to you and family. Looks very inviting! I like to dip in slightly tangy gravy! Mudde-saru all time fav Lunch.. I haven't tried this one so far. Thanks so much for sending it to the event. looks yumm..wanted to try it since I saw in LG's blog..
i love love mudde.., i prepare it once in a month. Mudde looks yumm mala. I love it anytime..
pretty picture.. the plate looks cute. never had ragi mudde. healthy one. 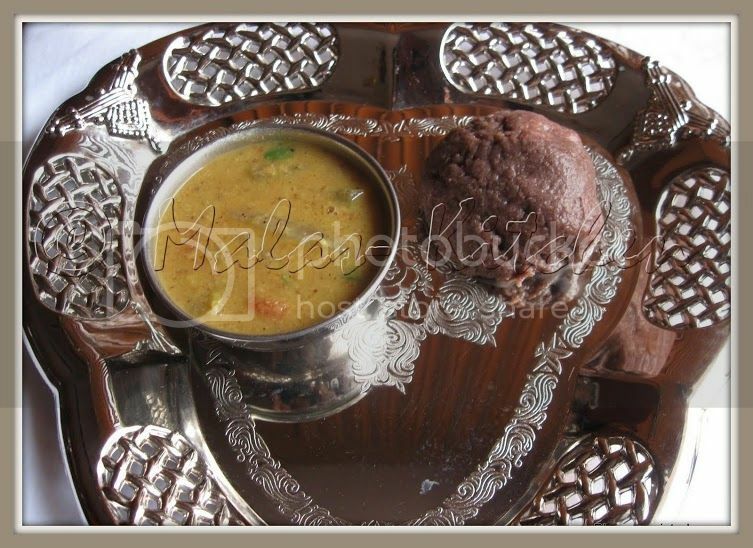 Ragi Mudde is a really Delicious dish. I want to make it today. thank you for sharing this recipe with us.